Hunters love their pets. When I started playing WOW, you could have 3 pets, period. I got UrsaMajor, a Loch Modan bear, and never considered getting another pet until Wrath of the Lich King brought exotic pets and the ability to have 5 pets with you at once. You didn't need to find a stable master when you could finely tailor the pets you might need to the raid, the group or the soloing experience. With Mists of Pandaria, our stable slots exploded along with new skin colors and new pets which were suddenly tamable. You're still limited to carrying only 5 but having a total of 55 stable slots means having a wide variety of pets at our disposal. But we still want more. While I don't have all my available slots filled, I know hunters who do. With new pets in Draenor, we are still looking around at all the animals populating the world and thinking, "Why can't I tame that?" Here are two cases in point. 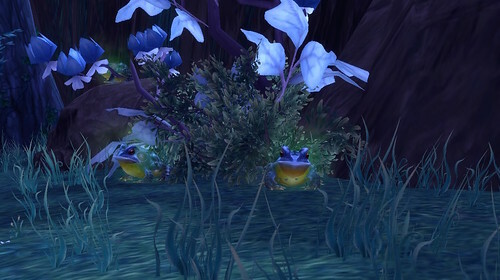 We met large frogs on the Timeless Isle. These two fellows are from Shadowmoon Valley. Frogs aren't tamable. I would imagine the animation to make a frog hop (race?) alongside you as you're riding off into the sunset makes these tough to offer. I'm envisioning their special ability would be a shooting poison or, as the battle pets can do, a sleep or a charm. I might actually tame a frog. Another animal I might actually get is this wolf from Shadowmoon. 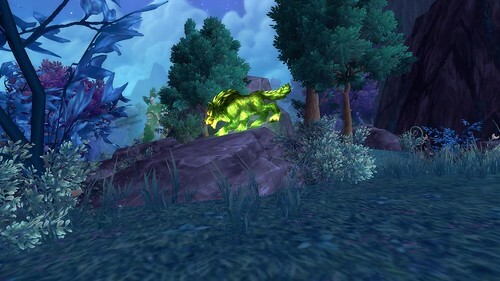 A number of hunters in my guild would tame one of these guys in a heartbeat, if they could. Their inability to be added to a hunter's stable may mean they are considered demons, rather than animals. They have been corrupted by the Shadow Council in residence nearby, as the frogs in the above photo have. Still, that green. I'm not a fan of wolves. I've never really liked their look but I'd get one of these. I remember when you couldn't tame the runed demon dogs of Wrath of the Lich King. They are to be found usually around warlocks. I have one in blue and you can get a green and a red version. I remember when they were added to the taming list so there is precedence for making a demon tamable by hunters. I know there is the special shadow wolf, Gara, available for hunters, but I don't care for the purple. So, Blizzard, we'd like to see these two pets added to our stables. Yeah, yeah, more stable slots would be nice, but I'll settle for the simple ability to tame these.